When in Siem Reap, it's a lot of fun just to be a tourist. Going to the night market is not something that regular Cambodians do. It is strictly for those out-of-towners who aren't too weary from trampling around temples. Most of it, as the name suggests, involves shopping for souvenirs but there is a central bar serving strong drinks and plenty of opportunities to get REALLY cheap massages. $4 foot massage for an hour? No problem! 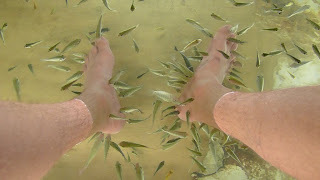 On this visit to Cambodia, I really wanted to try it out. I was hoping that the experience was better than their command of English. For $2, you get a massage that lasts about 20 minutes. This means that the fish are bringing in higher profits than their human counterparts! This does seem a little um, fishy. You do get a free beer, glass of wine or coke while you're getting your toes tickled. This was a huge selling point for me because I was thirsty and a little nervous about sticking my feet into nasty water filled with a school of potential pirrhanas. Here is the pool of water and the hungry fish. I don't think they get fed otherwise. Their diet consists entirely of tourist toe jam. Yummy. After sticking my toes into the pool, the sensation was almost unbearable. I have ticklish feet and the feeling of having thirty tiny mouths eat away at me like I was some sort of human buffet was very disturbing. But damnit, I sucked it up and endured it like a man. Eddie didn't seem that impressed but the girls at the pool next to us were more entertaining than the fish. At the end of twenty minutes, did my feet feel any better? Well, no but I walked away satisfied knowing that I had filled up lots of little stomachs and made them very happy even if they hadn't done the same thing for me.